No groups under 25 years of age. We live nearby and will greet you upon your arrival and will try to make you feel you're 'at home' for your rental time. Our houses are only 50-75 steps to the beach. We have a great water park now open and you will love a Myrtle Beach vacation in our house, with a direct ocean view of the famous Grand Strand of Myrtle Beach. This listing is for #918, Ocean Lakes Resort. (We have both #918 and #919 in the Holiday Inn section of Ocean Lakes) This are lovely beach houses with DIRECT OCEAN ACCESS AND VIEWS. We have FREE WI FI in our houses. Decorated in vibrant Caribbean colors, this privately owned beach house is completely furnished with everything to make your vacation the best ever. Our house has tile floors, a fully furnished kitchen, five tv's with extended cable, bar height table/chairs on deck for wonderful ocean view from deck, outside shower, grill, and washer/dryer and everything needed for a perfect vacation. We have two houses, built on the same plan, and located side by side - great for reunions and vacations with extended family. These are #918 and #919, in the Holiday Inn section of Ocean Lakes, this is the section closest to the beach. FREE wireless internet access. We are situated in the family oriented resort complex of Ocean Lakes, with a 10 MPH speed limit and patrolling security guards. Located only 50 steps from the beach, it's easy to make drink and potty trips. Parking under the house for three vehicles. Pets NOT allowed, NO SMOKING inside house (deck only). Our complex charges $10./day/vehicle for parking, which will be paid directly to them. After booking is confirmed, you will be mailed an Express Check-in form for use in registering your vehicles. Located in a privately owned community, this house is only 50 steps from beach where umbrellas and chairs are available for rent and patrolled by lifeguards for safety in spring and summer. We are located only 10 minutes from airport and downtown Myrtle Beach and pavilion area and 15 minutes from Broadway at the Beach. With our guarded entrance, 24-house security, and enforced 10MPH speed limit, you can feel comfortable to 'let the children go'. We have many on-ground facilities, including ocean side basketball and volleyball courts, horseshoes, bocce ball, bean bag, lakes (fishing) and carpet golf, as well as several playgrounds, making this ideal for all ages. We have an Olympic-size swimming pool, indoor pool, water park, snack shops, grocery store, nature center, oceanfront inflatable water slide, skate board area under the oceanfront observation deck and recreation center with planned activities. Also, provided at no extra charge, a wonderful, mile-long, private beach for use by our complex! Linen package may be provided for $125., which includes sheets for all beds, bath/hand towels, wash cloths and kitchen towels, no beach towels. Or you may choose to provide your own linens. Golf carts: we have golf carts that we can rent with our houses. Rates vary by season. GOLF CART RULES: DMV rules apply to golf carts in Ocean Lakes. Drivers must be at least 16 years of age and have a valid drivers license. 10 mph speed limit, no driving with open container. Parking fee: $10./day/vehicle, which is paid directly to Ocean Lakes. $500. refundable damage deposit during summer season. Refundable deposit is returned by VRBO within 14 days of your departure, in no violations/damage. House sleeps a maximum of 12. Hurricane policy: If there is a mandatory evacuation, a prorated refund will be given for days in effect. Renter is responsible for any fines assessed by Ocean Lakes to that guest or anyone in their group. Lost Keys will result in $75. fee from deposit. 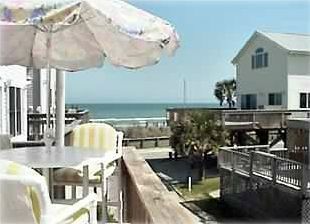 Only 50 steps from the beach, so you will have a good view from the deck. Bar height deck furniture for beach viewing. We spent spring break 2019 at this house with two other families. The house was perfect, specious, clean and working with the owners was a pleasure. Suzanne and Richard were very nice and helpful. The house was as stated. Make sure to note that the 4th “bedroom” is an open small den area upstairs. It is shown in the picture but easy to miss. Owners live across the street but privacy is respected. Easy to work with, very close to the beach! Would definately rent this house again. A lot of house for the money. Lovely family and we will welcome them back. We were greeted by the homeowner who is shortly across the road upon arrival, they were very nice and not in your business throughout the stay. The property was well kept and very clean, plenty of dishes, linens (with additional cost), and cleaning supplies. Walkbto the beach is VERY close and convenient. Best house at the beach!! I have been visiting ocean lakes for years and this was the best ever!! This was a delightful family and we enjoyed meeting them and glad they enjoy our house and facilities. Rates are from $950.-$32500./week. plus 12% tax and $300.00 damage/cleaning deposit. You may bring your own linens or have linen package provided ($125.00) and golf cart ($350. in summer) Linens and golf carts are optional and paid directly to owner after booking. Inquire about monthly rentals. Our complex charges $10./day/vehicle for parking, to be paid directly to our office, after booking is confirmed. I'll send you information about parking.